When you think of facials, you immediately think of pampering, of the soothing feeling that the experience provides. Facial spas in and around Scottsdale AZ are some of the best in the country when it comes to the latest and most effective facial techniques. And at both Inspire Day Spa and New Serenity Spa, we specialize in making our guests feel absolutely incredible following their facial. There are a number of different types of facials that you can get. From the comprehensive, deep cleansing hydrafacial, to those facials designed to help take years off. It really depends on your needs and preference. With some of the best estheticians in Phoenix, at Inspire Day Spa we guarantee you a relaxing experience that will leave your skin glowing! Is my skin dry or oily? Do I want to target fine lines and wrinkles? Is acne something that I am currently struggling with? Does my complexion seem lackluster and not as bright as it could otherwise be? The Hydrafacial: This is actually a multi-phase facial that combines the best of many of the others that we do offer. It includes the benefits of a chemical peel, a deep extraction as well as the special delivery of antioxidants and peptides that help your skin thrive. The hydrafacial is one the more popular all-inclusive facial treatments. Skin Brightening Facial: Our skin is daily exposed to the elements and as a result can become damaged and dull. The benefit of the skin brightening facial is that it works to treat that which damages the pigment and helps to restore your skin’s glow. Age with Grace Facial: Worrying about wrinkles as we get older is natural. With this facial, those fine lines begin to diminish. Your skin, in the end, appears firmer and plumper. It really does take years off! 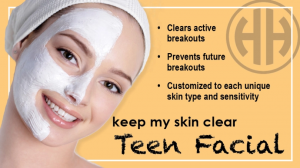 Teen Facial: Yes, teens love facials spas too! And so we have created a customized facial just for younger skin. They deal with a host of changes as they grow. And so the facial they receive should accommodate their more sensitive complexions. Whether you’re Phoenix or Scottsdale, AZ based, you will be delighted with what Inspire Day Spa and New Serenity Spa have to offer when it comes to facials spas. Any skin type—from dry, to sensitive, to dull and/or oily—we have the best products on the market. As we use the award winning all-natural Eminence line, we are confident that you’re going to love how you look and feel when your facial is done!